What Types of Ecstasy/MDMA Treatment Are Available? What Treatment Is Available for Teens? Ecstasy, also known as MDMA or Molly, is a popular synthetic party drug. MDMA use can become compulsive, even if only taken on the weekends. Regular use can also lead to both mental and physical problems. Numerous recovery options are available for Ecstasy treatment. When selecting an Ecstasy recovery center, focus on your personal needs and the severity of your addiction. Inpatient facilities: allow you to live at the location while focusing on your treatment. Outpatient programs: give you the freedom to continue to live at home while receiving treatment. Dual diagnosis programs: help those suffering from Ecstasy addiction and any mental or behavioral health issues. Because clients live temporarily in an inpatient treatment center, it is possible to create a controlled environment that is trigger-free. Individuals are less likely to relapse if they are not surrounded by the temptation present in their daily lives. This type of treatment is recommended for those suffering from a severe Ecstasy addiction. Residential facilities: These are what people typically think of when they think of rehab. link url=”//www.recovery.org/topics/find-the-best-residential-inpatient-rehab-center/” ]You live at these centers for 30 days, 60 days, 90 days[/link], or other customized time period, while receiving group counseling, individual therapy and other addiction treatment interventions. Luxury: These facilities are typically more expensive than typical residential options and have a vacation or resort feel with added amenities. Executive: Executive treatment programs are similar to luxury locations but are focused on allowing you to still work while receiving inpatient treatment. Outpatient facilities provide a great option for those who can’t leave behind work or family obligations for an extended period of time to receive treatment. Outpatient will be most beneficial for those suffering from a less severe MDMA addiction. Individual therapy – A therapist determines the cause of addiction and triggers for relapse while helping you build positive and healthy coping mechanisms. 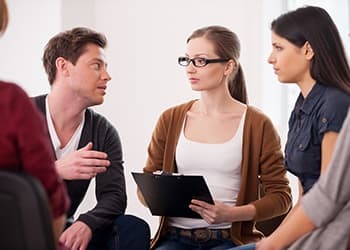 Group counseling – A therapist will lead a therapy session using many of the same models of individual therapy but will focus on interpersonal interaction and insight. SMART Recovery – A 4-point program focused on empowerment and the use of up-to-date scientific knowledge on addiction and recovery. Ecstasy abusers tend to report depressive symptoms and anxiety. Dual diagnosis means someone is simultaneously dealing with substance addiction and any mental or behavioral health conditions. To get the most out of your recovery, it’s important that you get evaluated by a medical professional for any co-occurring disorders before seeking treatment. Many treatment centers specialize in dual diagnosis, and this will benefit you as you begin your path to a sober and healthy life. Evidence also suggests that Ecstasy users are more likely to be poly-drug users, which could pave the way for a multi-substance addiction. No formal medications are used to treat Ecstasy dependence or tolerance. However, there has been some groundbreaking research on the administration of oxytocin, a naturally occurring bonding hormone, to those suffering from addiction. Preclinical research shows that delivering oxytocin to stimulant users helps to prevent self-administration of MDMA as well as the stress associated with being exposed to the substance. Research suggests that oxytocin could help prevent further addictions and can reverse the damaging social effects of long-term Ecstasy abuse. Who Answers? to speak with a treatment advisor about the costs of rehabilitation programs and how to pay for them. The cost of MDMA addiction treatment varies significantly depending on what kind of treatment you choose. Outpatient vs. inpatient: Typically, outpatient facilities are cheaper than inpatient facilities, with the exception of some very intensive outpatient programs. Inpatient facilities offer access to round-the-clock services and amenities that outpatient facilities do not, which is why the cost is higher. 12-step programs: Many 12-step programs and support groups are free and provide support and camaraderie while recovering from addiction. Many residential and outpatient programs incorporate 12-step programs. Furthermore, participation in 12-step support groups is encouraged as aftercare once inpatient/residential or outpatient treatment is completed. Duration: Cost is also affected by the length of your treatment. Inpatient rehabilitation can range from 30 days to 90 days or more, if required, and the duration will affect how much you pay. Addiction treatment can be expensive. Few are in a position to make a full up-front payment to cover the costs of a treatment program. Fortunately, you have a couple different options to pay for rehab. Insurance: Many insurance companies will provide partial or full coverage for drug rehabilitation. If you aren’t sure if your insurance covers addiction treatment, call to ask them about their rehab policy. Payment plans: Many facilities will create a payment plan for you to make monthly payments that are appropriate for your financial situation. Financing: Tap your savings account, borrow money from friends and family, use a credit card or take out a loan. People who complete treatment programs are at greater risk of relapse when faced with stressors and triggers. Aftercare helps a person stay clean and develop positive coping skills. It’s all about what works best for you. Some people enjoy the camaraderie and support from a group. Others benefit more from a 1-on-1 setting. Inpatient treatment facilities: Teens live at the facility while receiving treatment, which includes group and individual counseling, 12-step meetings and medical supervision. Some programs will allow teens to complete schoolwork while in treatment. Outpatient treatment centers: These programs allow participants to live at home and continue going to work or school while receiving individual and group therapy. Attending raves and clubs often. If you or a loved one is suffering from an addiction to Ecstasy, call 1-888-319-2606 Who Answers? to speak with a treatment support specialist about finding treatment programs today.
. Kalant H. (2001). The pharmacology and toxicology of “ecstasy” (MDMA) and related drugs. Can Med Assoc J 165(7):917-928.
. Trestman, R. (2015). Detoxification or supervised withdrawal. In Oxford textbook of correctional psychiatry. Oxford: Oxford University Press.
. Castillo-Chavez, C., Henso, L., Mejran, M., Rios-Soto, K., Castillo-Garsow, M., & Song, B. (n.d.). Raves, clubs and ecstasy: The impact of peer pressure. MBE Mathematical Biosciences and Engineering, 3(1), 249-266.